As ‘Lenta PMR’ news agency reports referring to eyewitnesses the office and activists of the Democratic Party ‘Proriv!’ were attacked by drunken fighters in the city of Bendery in Transnistria. Aggressors were lead by officers of State Security of Transnistria: Nikolay Struchkov, Dmitriy Kurlatov, Alexandr Dornya and others who were standing not far and calmly observing what was going on. Officers of the Ministry of Home affairs made nothing and were indifferent to the acts of violence towards young boys and girls. Fighters seemed to have been cooperating with ‘guardians of law’ as their groups resembled assault detachments of Ernst Röhm in a fascist Germany. 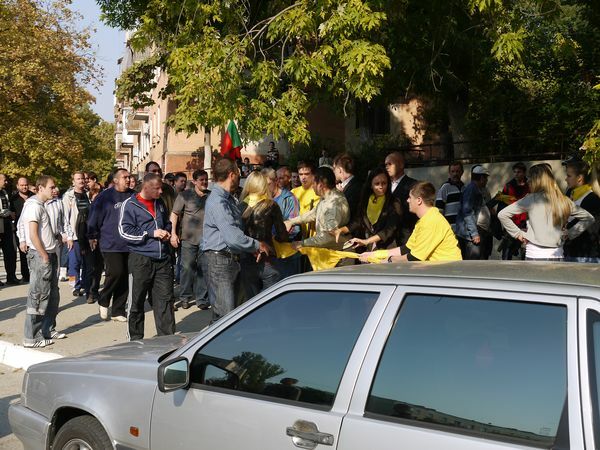 The second of October is the birthday of Bendery and activists of ‘Proriv!’ planned to celebrate it by a peaceful procession with the slogans ‘Proriv! – For changes!’ and ‘Together with Russia – For changes!’. But when the column was just about to go to the city-center, it was attacked. Fighters beat activists, broke banners, flags. They also tore party bandages, bandannas and other symbols off by force. The member of the Democratic Party ‘Proriv!’ Yulia Jukova, vice-speaker of the Youth Parliament Olga Ievleva and dozens of activists got physical injuries. The police didn’t take measures to arrest instigators. The incident resulted in prohibition of holding the political event which is guaranteed by the Constitution. Commenting on this, the chairman of the Democratic Party ‘Proriv!’ Dmitriy Soin said: ‘Unfortunately today the democracy in Transnistria was given up for lost. This was done by ‘dollar’ security officers and the minister of State Security Antyufeev will be satisfied. But no one will call our republic democratic state governed by the rule of law. The use of drunken fighters against young boys and girls, against the registered political party shows impotence and anger of the ruling regime. The changes are inevitable contrary to the governmental camarilla. Changes can’t be stopped by drunken aggressors and the ‘dollar’ State Security. Changes are needed by society and the state. The Democratic Party ‘Proriv!’ will continue its strike and win. We are going to address to the prosecutor’s office of Russian Federation for bashing up citizens of Russia in Bendery. It’s time for Moscow to pronounce on the conflict of people with the regime that rules in Transnistria’.